LAHORE: (Tuesday, July 17, 2018): Renowned journalists and senior analysts at a seminar have stressed the need of impartial role of media in general elections as they see the polls decisive for Pakistan’s future. They were addressing a seminar organized by Punjab University Institute of Communication Studies at Hameed Nizami Auditorium here on Tuesday. 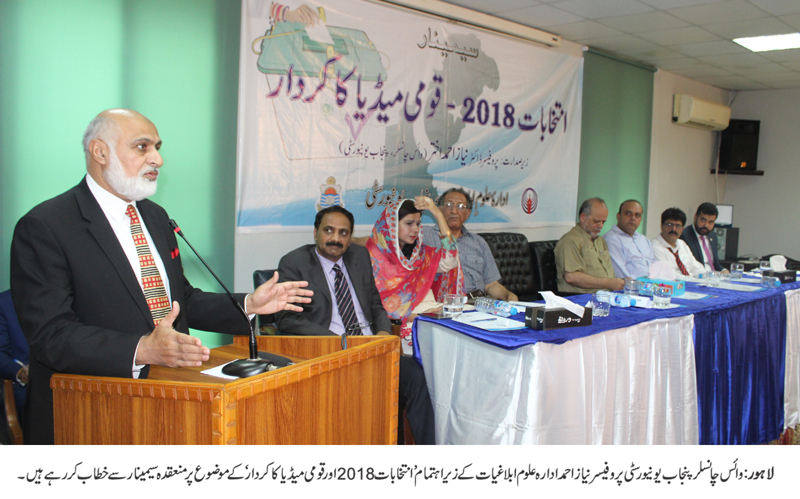 PU Vice Chancellor Prof Niaz Ahmad presided over the seminar while senior analysts including Dr Mujahid Mansoori, Salman Ghani, Mian Habib, Salman Abid, renowned anchor Osama Ghazi, Incharge Dr Noshina Saleem, Lahore Press Club President Azam Chaudhry, faculty members and students were present on the occasion. Addressing the seminar, Prof Niaz Ahmad said that a lot of investment and division had been witnessed in Pakistani media in the recent past. He said that today’s Pakistan was much stronger than the Pakistan in 2005 and our media must highlight positive achievements of the country. He said that our media students had very important role to play in providing information and guiding the nation in future. He said that our senior journalists and academics must train our students for this purpose. He said that institutions of higher learning must provide opportunities to students to think critically and discuss matters in an independent environment. 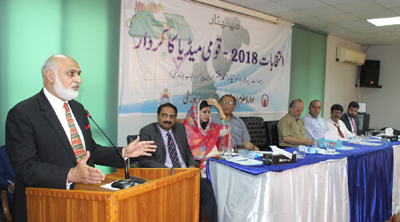 Renowned academic and senior analyst Dr Mujahid Mansoori said that Pakistani media was becoming aggressive, powerful and uncontrolled day-by-day and it was setting the direction of governance. He said that media’s power should be regulated under the constitution of Pakistan. However, he said, one of the media’s important contributions towards the country was awareness regarding accountability. He said that media had also audited role of politicians and institutions. He advised the students to study constitution of Pakistan as the upcoming journalists must have sound knowledge of constitution and law. He said that youth had very important role to implement merit and select true leadership. Senior analyst Salman Ghani said we had no liberty to speak all truth on media. He said that we were able to speak just a half truth. He said that the youth had significant role in upcoming general elections and they should vote without any pressure. He said that unfortunately our leadership was busy in maligning each other using media. He said that our media must focus on the issues of Balochistan because when Balochistan burnt, Pakistan burnt. Analyst Salman Abid said social media was playing more important role in election 2018 as compared to the national media, which has become a corporate media and safeguarding the interest of one party or the other. He said the real challenge was how the new government would tackle the fast increasing growing economic, security and other issues faced by the country. Senior journalist Mian Habibullah said that people must elect honest and able leadership in the election and youth vote was very important. He said smartphones and technology was actively being used in this election. He said the voters must follow the winning candidates after the election and keep them remembering the promises made in their election manifesto. Renowned anchorperson Osama Ghazi said private media was a commercial media and paid content was important to meet its expenses. He said earlier, in the absence of electronic media and social media, the candidates and parties used to exploit voters on the basis of language, caste, creed basis, however, now media had strengthened the element of nationalism. Lahore Press Club President Azam Chaudhry said media was playing a very pivotal role for strengthening democracy in the country as it was working as a watchdog to monitor the role of those institutions which are conducting the election. Tanveer Shahzad said that media was focusing mainly on the mainstream political parties and it was not educating the voters the way it ought to. Later, ICS Incharge Dr Noshina Saleem thanked the participants and souvenirs were presented to the distinguished guests.